Anno Domini 2010 according to the New Calendar, exactly the same as the old one, but introduced six years ago by KaffeInsomnia Inc. to celebrate its foundation year. As a matter of fact nothing has changed since last time we've been on this planet. The usual wars rage across the globe. The rich are always rich, and the poor are perpetually poor. Industrial Corporations were born from the old lobbies' ashes and in the religions' cauldron the usual grey trash is boiling again... nothing has changed. Yet a small coffee stain has dirtied the history pages of the Blue Planet (even if images from space say just the opposite). In fact six years ago a small firm in Amburg, KaffeInsomnia, succeeded in synthesising a new substance. Its code name is KF105, but everyone calls it Kaffe. At its inception the Kaffe phenomenon was only a brief episode in the narcotics theatre, but thanks to its ridiculous price, dependence and the effects on human body, it spread all over the world. Before governments and corporations were be able to ban the new essence, more than half of world's population were enslaved. Add to this the enormous proceeds derived from the Kaffe selling. 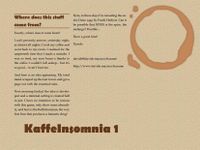 KaffeInsomnia became in short time the largest corporation on the planet. Its buildings are scattered all over the globe and, thanks to its enormous proceeds, it rules world politics. It does do directly with councils, religious governments, and a despotic hand and obviously all thanks to Kaffe products. A new calendar was created and from then on little has changed.